Yamaha CX5M The CX5M was built to the MSX standard, which included slots for inserting programmed cartridges. These extended the machine's capability, accepting a range of games, office applications and so on. 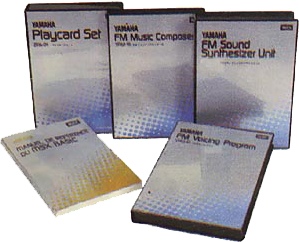 Yamaha produced a range of cartridges including a programmer for Yamaha's DX range of FM keyboards and a real-time sequencer. Two of these, the Voice Editor and Music Composer, allowed the user to programme a bank of 48 sounds for the CX5's own built in synthesiser and to sequence up to eight channels of music, controlling the built-in module or external instruments via MIDI, in step-time using a musical-stave input screen.